Info Edge (India) Ltd, the company behind job search portal Naukri, matrimonial site Jeevansathi and property search venture 99acres, which has made a string of investments in consumer internet ventures, saw its investee firms maintain close to 75 per cent revenue growth though their operating losses doubled last financial year. More than half of the loss was due to the breakneck pace growth of its crown jewel Zomato, the restaurant listing and review site which is estimated to nearing a $1 billion valuation. 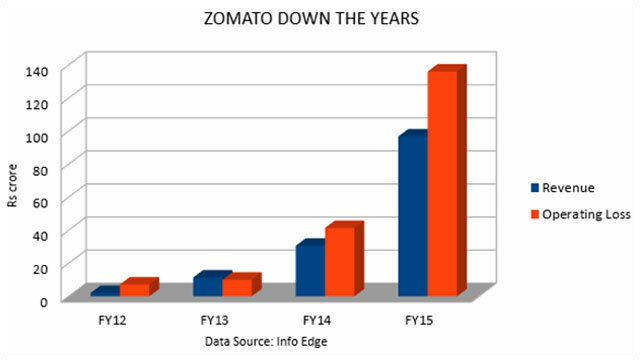 Zomato, which recently expanded to allow food orders online and has been aggressively expanding overseas with as many as nine firms in its kitty in the past 12 months alone, saw operating revenue rise over three times from Rs 30.6 crore in FY14 to Rs 96.7 crore last year. Its operating EBITDA loss in the same period also more than tripled to Rs 136 crore from Rs 41.39 crore in the year ended March 31, 2014. Info Edge owns just over 50 per cent stake in Zomato and counts it as a subsidiary, though it is not directly involved in operations. Meanwhile, Info Edge's other key investment, online assessment venture Meritnation seemed to have focused on consolidating its business last year. Applect Learning Systems Pvt Ltd, the firm which runs Meritnation, saw its revenue growth coming to a halt after more than doubling it in previous two years. 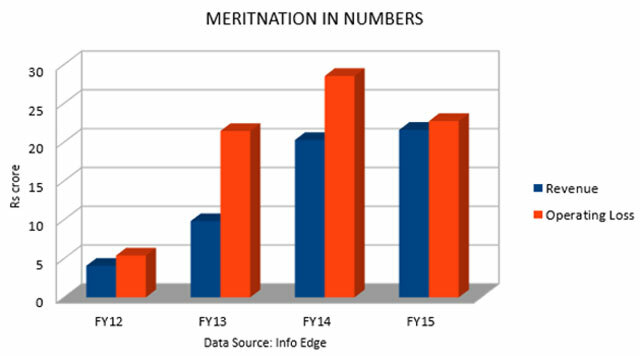 Operating revenue growth for Meritnation was just 6.5 per cent to Rs 21.59 crore. However, the firm managed to restrict its operating losses which declined by a fifth to Rs 22.72 crore. Info Edge, which has 56 per cent stake in Meritnation, also counts four other investee firms—PolicyBazaar, Canvera Digital, MyDala and Happily Unmarried—as associate firms in which it owns minority stake. These firms out together churned out around 50 per cent operating revenue growth to clock Rs 211.75 crore but saw their operating losses rise at a faster pace. Operating EBITDA loss of these four firms was pegged at Rs 74.52 crore against Rs 46.15 crore in the previous year. These firms had pared losses in FY14 over FY13.